Teams from Maryland, Ohio, Pennsylvania, Virginia and Washington D.C. to participate in event March 23-24 at Navy-Marine Corps Memorial Stadium in Annapolis, Md. Some of the top high school lacrosse teams in the country will face-off in the LacrossePlayground.com Spring Classic Presented by Motive Pure. The inaugural event will be held March 23-24 at Navy-Marine Corps Memorial Stadium in Annapolis, Md. and features six high-action boys’ and girls’ high school lacrosse games. The event continues on Saturday with five games spanning the day. The 12 teams in the event represent the District of Columbia, Pennsylvania, Maryland, Virginia and Ohio. Lacrosse Playground has established an immense following as an authentic voice for lacrosse players since its inception three years ago and looks to continue moving forward with a new partnership with Motive Pure™. Motive Pure™ is the superior rehydration solution allowing you to perform at your best for longer periods of time. Lacrosse Playground is the original website for news and information about lacrosse equipment, apparel, and lifestyle. Now, with the LacrossePlayground.com Spring Classic, Lacrosse Playground looks to provide more in-depth coverage of the game itself. Suites are available for group pricing. Contact info(at)lacrosseplayground(dot)com. 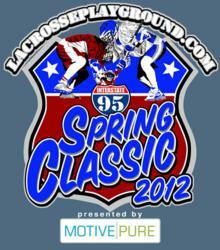 The event brings together some of the finest high school lacrosse programs in the country, highlighted by the 2011 No. 1 ranked team (Haverford) (as ranked in Lacrosse Magazine’s final standings in 2011). The featured game on Saturday evening pits Washington, DC’s first public school lacrosse team, Woodrow Wilson High School, against Baltimore Polytechnic Institute. The impressive lineup includes the following nationally ranked teams from Lacrosse Magazine’s Mid-Atlantic 2012 rankings: Haverford (ranked #2), Loyola (ranked #5), Landon (ranked #8); the defending WCAC champs (Gonzaga College High School) whom Lacrosse Magazine ranked #16 in the country in 2011; the defending Maryland 4A West Division Champions and 4A/3A West Regional Champions (Wootton High School); Upper Arlington is currently ranked #3 in Midwest according to Lacrosse Magazine. Motive Pure™ is a rehydration solution that quickly and efficiently replenishes vital electrolytes. Motive Pure™ contains zero sugar, zero artificial flavors, and zero artificial colors. Motive Pure™ is great for anyone needing to rehydrate. It is especially valuable for athletes of all kinds. Learn more about Motive Pure™ on Facebook and Twitter. Lacrosse players are the biggest gearheads on the planet. Whether it be pining over the latest stick technology, learning new stick-stringing techniques, or spotting a fresh set of gloves from the stands, equipment is more than just a tool for lacrosse players; and lacrosse is more than just a game, it’s a lifestyle. Founded in 2008, LacrossePlayground.com is the nation’s premier blog dedicated entirely to lacrosse equipment, lacrosse apparel, and the lacrosse lifestyle. In 2009 Lacrosse Playground launched its sister site, LaxTweets.com. Follow Lacrosse Playground on Facebook at facebook.com/lacrosseplaground, or on Twitter at @LaxPlayground.